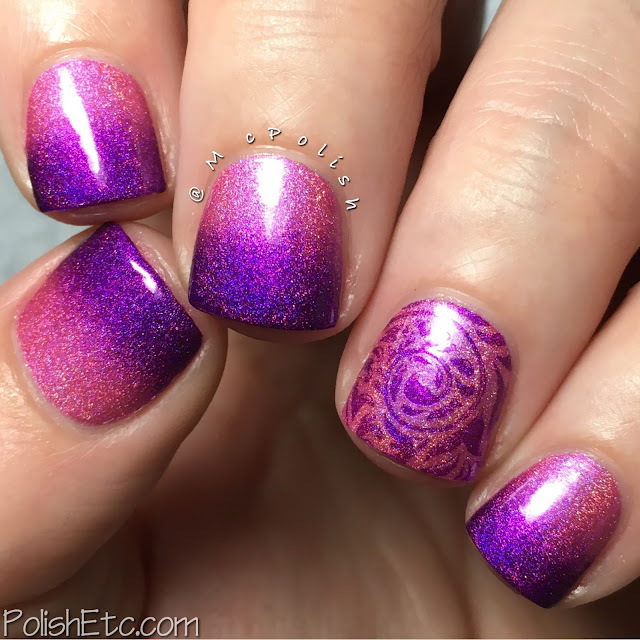 Gradient Nails for the #31DC2016Weekly - Polish Etc. This week's prompt for the 31 Day Nail Art Challenge is gradient nails. I attempted a scaled gradient that turned out to be a complete nail fail. 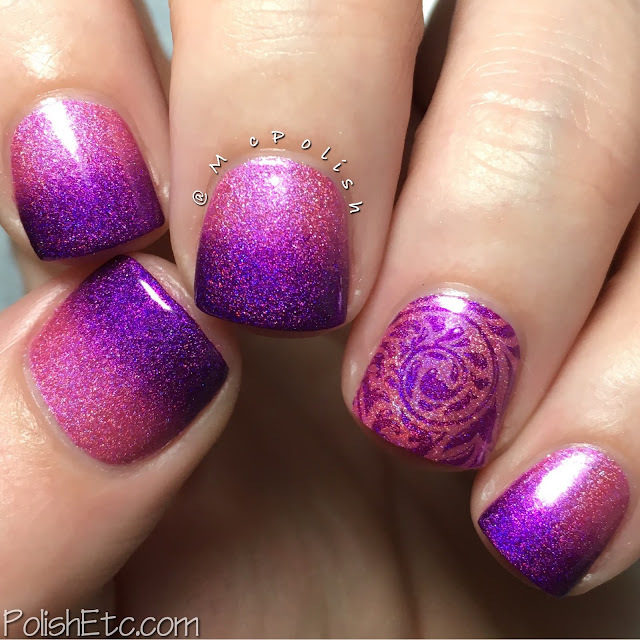 So I ended up settling with a classic two color gradient with a little bit of stamping on an accent nail. I always like doing gradient nails. They are sort of messy but always give a nice effect. I used a makeup sponge for my gradients. Since I have short nails, the two color gradient seems to work the best. But I have done up to a four color gradient on my shorties. I can't get as smooth of blend with four colors as I can with two, so I prefer the two color method. For this look, I used two Cupcake Polish holographics. The pink holo is "Barbie Girl" from the Life in Plastic Awesome Sauce Indie Box. The purple is "Berry Good Looking" which is the most popular Cupcake Polish ever. My accent nail is a base of "Barbie Girl" with a stamp of "Berry Good Looking" with a design from the UberChic 4-02 Plate. I used the UberChic XL clear jelly stamper head to make sure the design was centered. This is quite a girly mani and I really liked it! What do you think? Well, we have made it though the first set of prompts for the challenge. Next week we start on specific nail art techniques. If you want to see more of this challenge, he sure to check out the #31DC2016Weekly tag on these social media outlets: Instagram, Twitter and Facebook. There are some great nail art looks out there!